Guaranteeing stronger rights protections for all, including minorities and indigenous peoples, rather than building walls or restricting travel, is ultimately the only effective and sustainable response to the forced displacement of millions of people around the world today, says Minority Rights Group International in a new report. The rights organisation is launching No escape from discrimination: Minorities, indigenous peoples and the crisis of displacement to mark International Migrants Day. The report focuses on the discrimination behind displacement among minorities and indigenous peoples, and the drivers uprooting them from their homes, such as conflict and extremism. In Myanmar, amidst an orchestrated campaign of executions, sexual assault and village burning, more than 620,000 Rohingya have been forced to flee during 2017. But their persecution has its roots in their exclusion from the list of 135 state-defined ethnicities in the 1982 Citizenship Act. Violent crackdowns, dislocations and discrimination meant that the majority of Rohingya people could not meet subsequent documentation requirements, in practice rendering the whole community stateless. Minority communities, such as Yezidis, are at risk of disappearing in Iraq following large-scale violence and displacement. In Central African Republic, violence by anti-balaka fighters has led to the virtual removal of the country’s Muslim minority in some areas. Climate change and land rights violations also play a part. In Colombia, military and business interests have exploited the vacuum caused by the decades-long civil conflict to appropriate large swathes of communal land belonging to Afro-Colombian and indigenous populations, who comprise 70 per cent of those displaced in the first half of 2017. In India, of the more than 60 million displaced by mining and industrial developments since independence, around 40 per cent are Dalits and another 40 per cent tribal people. Hundreds of thousands of nomadic herders in Mongolia have been forced in recent years by increasingly unstable weather conditions to resettle in Ulaanbataar, where they reside in informal settlements without access to basic services or adequate housing. Importantly, the report also looks at how discrimination shapes the experience of minorities and indigenous peoples whilst in transit. Members of religious minorities from Syria who have fled to refugee camps in neighbouring states such as Jordan or Lebanon, may face continued discrimination not only from officials and citizens in their host country, but also from fellow Syrians belonging to other communities. Finally the report examines the hostility from majority communities to new arrivals, and how this shapes the experience of integration and inclusion once minorities and indigenous peoples settle in the new countries they now call home. Hostile attitudes about diversity and multiculturalism which were once fringe have now become mainstream, whilst the debate about current immigration and the needs of long-established minorities within arrival countries has become blurred, says MRG. In Hungary, the recent vilification of refugee arrivals, particularly Muslims, has exacerbated age-old discrimination against Roma. In the Netherlands Wilders has specifically spoken about the country’s ‘Moroccan problem’ and was convicted by a court in December 2016 of inciting hatred. 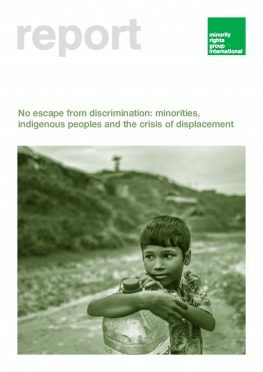 No escape from discrimination: Minorities, indigenous peoples and the crisis of displacement is available for download here.